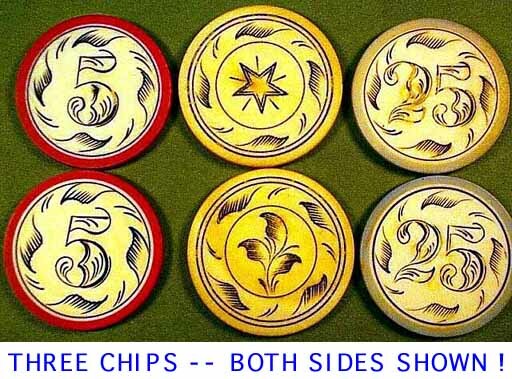 There are three different chips: a "5", a "25" and a great new design chip with a star, circle, etc. on one side and a three-leaf plant, circle, etc ON THE OTHER SIDE!!!! sizable set, so it is not an error or an experimental chip. Here, below, are more recent pictures of the ivories, showing the reduced condition. Note that only one "5" is left, and it has a small nerve hole in the center. The star leaf chip you will be getting will NOT have that nerve hole. The "25" shown is representative. $175 for the star/3-leaf one, OK-used-fine condition ... I have in OK, but lesser condition for less money; happy to email you sans. SOLD OUT OF THE "5" CHIP -- $45 for my last "5," OK-used-good condition, except than there is a small pin-size nerve hole in the center of the chip. $65 for a "25" -- maybe a slight edge crack on the "25"; or there might be no edge crack but some paint missing from the engravings, or both "problems." Otherwise in decent condition. Cite your preference, or leave it to me to give you the most attractive chip.